Coming to Harrogate Theatre - UK Foo Fighters leader Jay Apperley singing with the real Foo Fighters with Dave Grohl on guitar. The ‘Ultimate Foo Fighters Experience’ is promised in an exciting night of live music for charity at Harrogate Theatre. The show will amount to the culmination of the real-life story of a Harrogate group’s phenomenal rise to international fame over the last decade. After spending more than ten years growing from a humble covers band in Harrogate pubs into one of Britain’s most successful tribute bands filling 2,000-plus seater venues, the UK Foo Fighters are to play a special homecoming gig at Harrogate Theatre. Such is this Harrogate band’s reputation, founder member Jay Apperley was invited on stage by Dave Grohl to sing lead vocals with the real Foos. Taking place on Friday, May 17, the UK Foo Fighters show will take the Harrogate Theatre audience on a journey spanning three decades of music from the legendary Foo Fighters. Presented by Speedsta Promotions , the event will see organisers Phil Lowe of Harrogate Theatre and Jay Apperley of the UK Foo Fighters donate all profits to Harrogate Hospital’s Cardiac Unit and Harrogate Theatre’s restoration programme. A unique made-for-the-theatre show at Harrogate Theatre; one half acoustic, one half rock (inspired by the Foo’s fifth and only studio double album to date In Your Honor), the night will offers a unique opportunity for fans both old and new, exploring both the melodic acoustic recordings from the Foo’s live acoustic album Skin And Bones recorded at the Pantages Theatre in Los Angeles, building to a master class ‘rock stadia’ experience inspired by Foo Fighters most recent Concrete And Gold World Tour. The UK Foo Fighters are renowned for capturing the true vibe of a Foo’s live experience, all performed down to the closest detail making it a truly unmissable show for any rock music fan. From playing originally in the likes of Harrogate’s Blues Bar, the UK Foo Fighters have not only featured in Rolling Stone magazine, NME, Kerrang! Planet Rock and Classic Rock, they’ve been the subject of a BBC documentary. Frontman Jay Apperley even enjoyed the amazing experience of singing lead vocals on White Limo off the Wasting Light album with the real Foo Fighters at a concert in Brighton in 2014 while Dave Grohl backed hin on guitar. The UK Foo Fighters are a truly local band who’ve made good, and also feature Jamie Valentine (lead guitar), Arron Warner (bass), Nick Wight (keyboards) and Alex Bailey (drums). 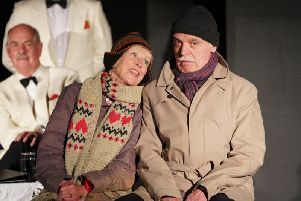 Some special guests are expected at Harrogate Theatre and the MC will be Graham Chalmers of the Harrogate Advertiser. Tickets for the concert are available now at Harrogate Theatre online or in person.